SEHİTKAMİL, GAZİANTEP, TURKEY, September 5, 2017: A specially retrofitted screen changer for use on a PET polymerization line has enabled KÖKSAN PET Packaging Industry Company to prolong the working life of the melt filters and improve the quality of the preforms and bottles that are produced in subsequent operations. 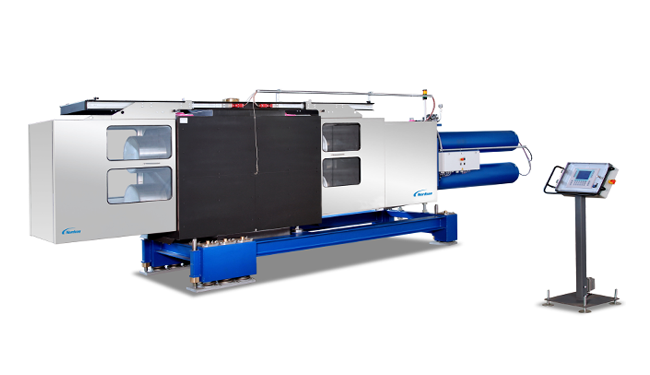 KÖKSAN, an integrated producer of resin and a wide range of PET packaging products, had been using a standard version of Nordson Corporation’s BKG® POLY™ screen changer, whose large filtration area is designed for high-volume polymerization. This unit has eight screen cavities, each of which contains a flat screen supported by a breaker plate. In the retrofit carried out for KÖKSAN, Nordson replaced these screens and breaker plates with new-design breaker plates, each bearing multiple filter candles. This increased the filtration area by a double-digit factor and provided an enhanced filtration fineness in comparison with the flat screens. The result is an increase in efficiency that has significantly extended the working life of the filters; minimized the occurrence of black specks and gels, and dramatically reduced the differential pressure at the lower shear stress on the polymer. Nordson’s filter candles are pipe-shaped components that are installed so they are parallel to the direction of melt flow. Melt enters the candle through a filter pack, is guided to the inner core of the candle, and emerges downstream. The candles are used on screen changes to increase filtration area without increasing machine size or affecting throughput. This design, in turn, reduces pressure losses and residence time for the melt. Filter candles are available in various sizes and filtration finenesses. Screen changes retrofitted with the filter candles can still be operated with standard screens and breaker plates. This possibility offers another advantage: For the start-up process or after a shutdown, flat screens provide a much more cost-effective alternative to any other filter media until the specified material quality in the polymerization process is achieved, so that the further production can be continued with filter candles to ensure best product quality and longer filter lifetime. In the BKG POLY filtration system, there are four screen cavities on each of two pistons, so that the melt flow is subdivided into eight flow paths. Changing of filter elements is signaled when the pressure differential between the upstream and downstream sides of a filter element reaches a designated level. While one of the pistons removes two of the screen cavities from the process for filter element replacement, melt flow remains uninterrupted through the other six cavities. As a result, production continues during changing of the filter elements without use of any additional valve or device. KÖKSAN PET Packaging Industry Company is based in Şehitkamil, Gaziantep, Turkey. Tel: +90 (342) 357 0330 10. Fax: +90 (342) 357 0347. Email: [email protected]. Visit www.koksan.com. Nordson Corporation engineers manufacture and markets differentiated products and systems used for the precision dispensing of adhesives, coatings, sealants, biomaterials, polymers, plastics and other materials, fluid management, test and inspection, UV curing and plasma surface treatment, all supported by application expertise and direct global sales and service. Nordson serves a wide variety of consumer non-durable, durable and technology end markets including packaging, nonwovens, electronics, medical, appliances, energy, transportation, construction, and general product assembly and finishing. Founded in 1954 and headquartered in Westlake, Ohio, the company has operations and support offices in more than 30 countries. Visit Nordson on the web at http://www.nordson.com, @Nordson_Corp, or www.facebook.com/nordson.